Red Band Trailer for 'The Five-Year Engagement,' directed by Nicholas Stoller and starring Jason Segel, Emily Blunt, Chris Pratt, Alison Brie and Rhys Ifans. Also below is a featurette taking an in-depth look at the characters played by Emily Blunt and Alison Brie, and the preparations that went into those roles. 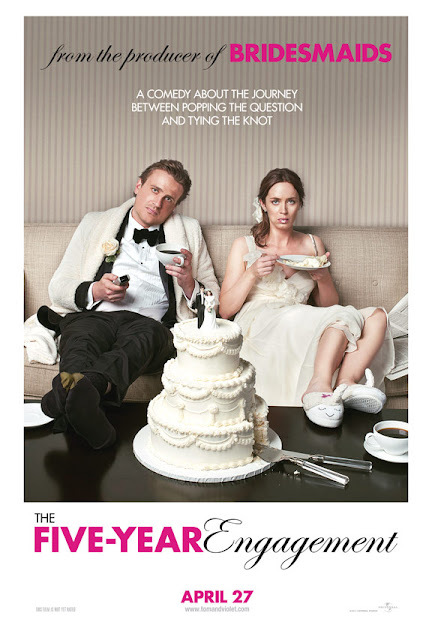 The director and writer/star of Forgetting Sarah Marshall reteam for the irreverent comedy 'The Five-Year Engagement.' Beginning where most romantic comedies end, the new film from director Nicholas Stoller, producer Judd Apatow (Knocked Up, The 40-Year-Old Virgin) and Rodney Rothman (Get Him to the Greek) looks at what happens when an engaged couple, Jason Segel and Emily Blunt, keeps getting tripped up on the long walk down the aisle. The film was written by Segel and Stoller. 'The Five-Year Engagement' opens 27 April for America, 22 June for Ireland and the UK.